[154 Pages Report] The location analytics market size is expected to grow from USD 8.20 Billion in 2016 to USD 16.34 Billion by 2021, at a Compound Annual Growth Rate (CAGR) of 17.6% from 2016 to 2021. Location analytics is the Business Intelligence (BI) process to generate insights from the location-based or geographic business data. It empowers organizations across various industry verticals to combine the traditional BI data with the spatial data, collected using various data sources such as cameras, sensors, Global Positioning Systems (GPS), mobile devices, and social media channels. The base year considered for this report is 2015 and the forecast period is 2016-2021. Analysis of location analytics market begins with capturing data on key vendor revenues through secondary research sources such as ITU union, Mobile Ecosystem Forum (MEF), and GSM association. The bottom-up procedure was employed to arrive at the overall market size of the location analytics market from the revenue of the key players in the market. 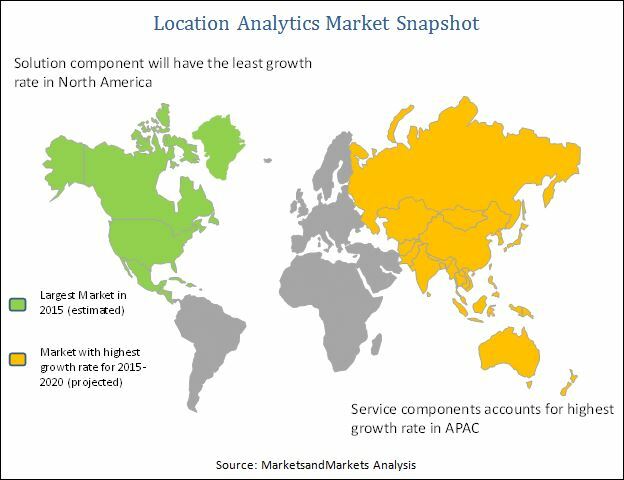 Analyzing market trends in various regions/countries supported by the location analytics service providers and customers spending in respective regions/ countries. Overall market size values are finalized by triangulation with the supply side data which include the product developments, supply chain, and value chain of location analytics across the globe. After arriving at the overall market size, the total market has been split into several segments and subsegments. The figure below shows the break-down of the primaries on the basis of companies, designations, and regions, conducted during the research study. The location analytics market comprises of software and service providers such SAS Institute (U.S.), TIBCO Software Inc. (U.S.), ESRI (U.S.), Oracle Corporation (U.S.), Pitney Bowes (U.S.), Microsoft Corporation (U.S.), IBM Corporation (U.S.), Galigeo (France), Cisco systems (U.S.), Alteryx, Inc. (U.S.), and SAP SE (Germany). Other stakeholders of the market include telecom providers, cloud service providers, network solution providers, wireless service providers, and independent service providers. “The research study answers several questions for the stakeholders, primarily which market segments will focus in the next two to five years for prioritizing the efforts and investments”.